The five Tees Valley local authority leaders have approved a £588million investment plan over the next ten years. The announcement also says that this will create over 16,000 jobs. Santander has announced they will be closing 140 branches across the UK. In the North East & Cumbria the branches affected are in Cockermouth, Workington and North Shields. Is the name of the new apprenticeship campaign launched by the DfE on the 17th January. The Government is to write to the largest school trusts who have not published information on their website about how they will ensure providers of vocational education are able talk to pupils in their schools. They are also to write to local authorities to remind schools about the requirement to make sure pupils have the full range of information about different career paths that are open to them. Two items about careers work in schools. The first is a report commissioned by Teach First, the graduate teacher recruitment service. Career-related learning in primary: The role of primary teachers and schools in preparing children for the future. The report provides evidence for the benefits of career development activities for children in the primary phase. NB Using The Times Top 100 Graduate Employers as the source, Teach First recruits more graduates than any other organisation in the UK. The second are classroom careers resources for KS3 and KS4 pupils The future of work:classroom lesson plan has been created by Nesta and is designed to equip upper KS3 and KS4 students with the latest information about the changing world of work and the skills that are likely to be in demand in the future. Northern Power Futures festival taking place at Boiler Shop in Newcastle, and an invitation for young people aged 16+ to join our speed mentoring event on Monday 11th February 2019 between 3.30pm and 5pm. The speed networking element of the day will be a great opportunity for young people to speak directly to individuals from a range of organisations and sectors across the North East such as EY, Visualsoft, Nissan and Virgin Money plc to name but a few. The event will also contribute to Gatsby benchmark 5 for both schools and colleges. Hot on the heels of December's edition, this is the January edition of Pathfinder with more help for ex service personnel. The ONS UK labour market release for January 2019 is as usual an interesting read. The UK has the highest number of people in employment and the highest employment rate since records began in 1971 - 32.53 million people and 75.8%. The employment growth in the last year has been through full-time work - see below. 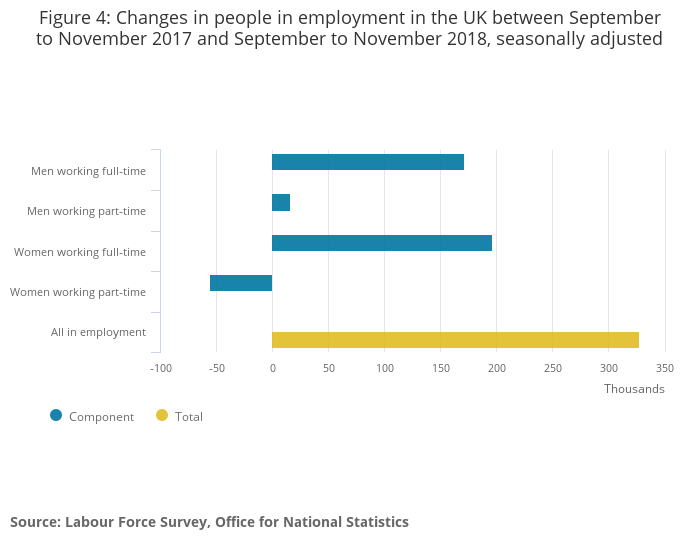 However while there was an increase in the UK, employment numbers for th those over 16 in the North East fell in the last quarter and there was in increase in unemployment to 5.5% up by 15 from the previous quarter.